I love camping, I really enjoy caravan parks and how easily you and your kids make friends. I love living outdoors and having dinner around the bbqs with a bunch of other families. Camping is pretty cruisy and relaxing and you just go with the flow. Caravan Parks have such a great atmosphere... most of the time. But, there are some things that people do that really,really irritate me. Some people are really inconsiderate of others around them. They seem to forget that we are all living in pretty close quarters, and some of us have canvas walls and others are just thin plywood. 5 Simple rules for staying in a Caravan Park. 1. Camping is not the time to teach your baby to sleep using the 'cry it out' method. For the last two nights half the caravan park has been kept awake by a baby and bloodcurdling, distressing crying sessions in the middle of the night. The baby goes on for well over an hour, with no apparent parent attention... What the? As a Mum I totally understand that sometimes kids cry and there isn't a lot you can do, but, you have to do what you can, and if that means driving around at 2 in the morning so you don't disturb other campers, then you just do it. 2. If you want to party until 1am, rent a house, don't stay in a caravan park. Granted its mostly teenagers, and yes I'm sure we've all been there. I was a culprit too, and now I seem like a grumpy old woman (I am going to be 39 this year). But nobody wants to hear your drunken screaming after 10pm quiet time. If someone asks you to quiet down, don't try to fight them, chances are, they know most of the other people in the caravan park. 3. Don't sit right next to someone else's campsite and light up your cigarettes. The smoke wafts inside tents and caravans and sticks around. I don't want my child breathing your second hand smoke. I don't venture out to the great outdoors just to smell your cigarette smoke. Be considerate and go where nobody else is. 4. Follow the speed limit. My Mumma bear instincts come out in this area in particular. I have not problem with yelling 'slow down' to people driving fast through the caravan park and shooting them dirty looks, It scares the daylights out of me, because I have a fast toddler with limited road sense. The speed limit is 8km/h or walking pace for a reason, there are so many small kids around its just so dangerous to go any faster. 5. Clean your gross food residue off of the BBQs after using them. Just annoying. This has come off a bit more ranty than I intended, but let's go with it shall we. I guess I just don't understand some people and how inconsiderate they can be. I feel like I make a big effort to camp in 'harmony' and think about and respect others. Some people it seems are just on a whole other wave length, and it drives me batty. I hope this doesn't put you off camping, it really is one of my favourite things to do. I just hate these things!! What are your camping pet peeves?? Linking up with Jess from Essentially Jess for #IBOT head over and check out some other great posts! 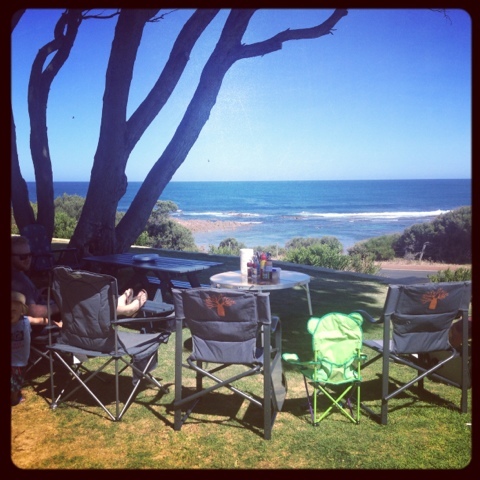 15 comments on "5 Simple Rules for Staying in Caravan Parks"
I agree Karen ... I would add don't let your children under 6 wander without supervision and certainly not knock on my caravan door at 7am to play or stay for hours while you do nothing. Not much of a camper here, but we did recently stay at a site where it was a mix of accommodation (camp sites, cabins, caravans) and I was stunned at how fast some cars drive through those sites! Hope you get to relax and some campers get a chance to read your list! My peeve would be people leaving their washing in the machines or dyers for hours! Oh yes, you have articulated all my caravan park pet peeves! Esp the smoking one - oh how I hate it when peeps smoke near children! I haven't reached that stage yet, but I know it would drive me crazy too!!! I know, it's always the minority that ruin it for the majority! Sometimes I feel like the caravan park police!! It amazes me as well! My Dad is amazing, he follows people back to their camps and gives them lectures about driving too fast, because he cares about all the kids! As they chill out at the beach!! And the ridiculous cost for the machines too!! I think I could have written one point, just 'inconsiderate people' haha! The good definitely out weighs the bad!!! I really do love it! Yep respectful is the right word!! I make sure if Ezra is up early being noisy I take him for a walk so we don't wake other people up! I hate this too trish! I had a friend recently tell me how nice her holiday was because she didn't 'g see her kids all day. 1 someone you didn't know wad caring for them 2. What if they were not vey nice to kids!